Fifty years ago, women were considered too frail to run marathons, and were thus not allowed to run in the Boston Marathon as official entrants. 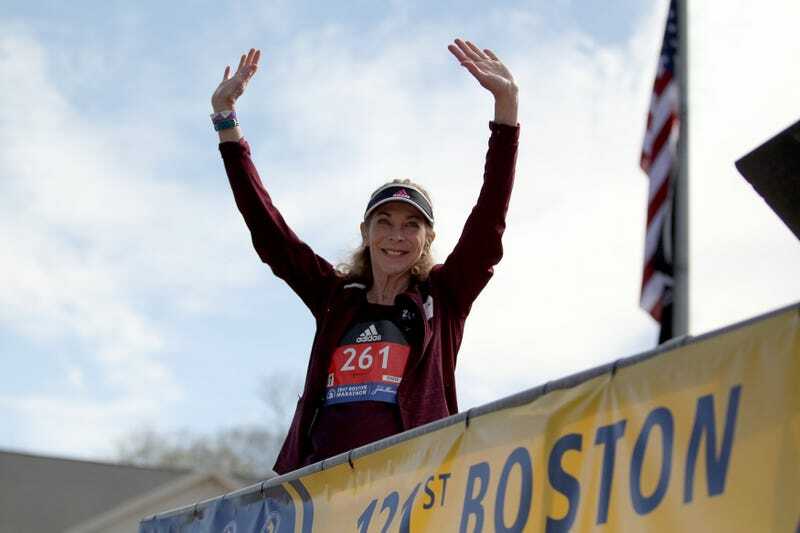 In the 1960s, several women had completed marathons as bandits, but no woman had actually registered and completed the Boston Marathon until Kathrine Switzer did it in 1967. She registered as K.V. Switzer, how she always signed her name, and received bib number 261. She dodged attempts to remove her from the course and finished the race in 4 hours, 20 minutes. A photo sequence her fighting off a man who tried to forcibly remove her from the race has since become one of the most enduring images in the history of the marathon. Today, at 70 years old, Switzer ran the race again. Wearing the same bib number she did in 1967, she finished in 4:44:31. She was the 9,859th woman to finish today’s race. This will be the last time anyone wears bib number 261, as officials have retired the number in honor of Switzer.